We don’t buy boxes any longer - just the big bags. I use baking soda everyday to clean my mouth, teeth, brushes, etc. I think the use of baking soda is one of the reasons I don’t get colds and have never had the flu. Natural baking soda is known as nahcolite, which is part of the natural mineral natron. Natron contains large amounts of sodium bicarbonate. Ancient Egyptians used natron as a soap. History suggests that many civilizations used various forms of baking soda in making bread and other foods requiring rising. In 1846, Dr. Austin Church and John Dwight began to make and sell the compound we use today. In the 1860s, baking soda appeared in cookbooks. In the 1930s, it was advertised as a “proven medical agent.” In 1972, someone thought up the idea of keeping a box of baking soda in your fridge to keep food fresh and control odors. 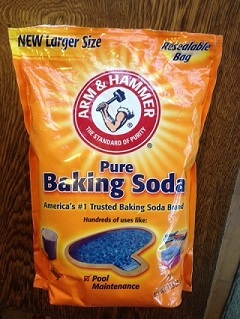 In 1988, I read somewhere that baking soda used at 4 teaspoons or 1 rounded tablespoon per gallon of water worked well to control fungal diseases on plants - and it worked. Later it was tried at a half cup per gallon to control ball moss in trees - and it worked. And there are many more uses for this wonderful product. Ulcer Pain: It’s reported that baking soda will immediately neutralize stomach acid. Dosing is typically 1-2 teaspoons in a full glass of water. Heart Burn: Taking about ½ teaspoon at the onset of heartburn works great. I rarely have this problem, but bad food occasionally brings it on. Splinters: Use about a tablespoon per 8 once glass of water. Soak the affected area twice a day. Splinters will often come out on their own after a couple of days using this treatment. Sunburn: Use ½ cup of baking soda in your bathwater, then soak for natural relief. Let your skin air dry, rather than toweling off the excess baking soda, for extra relief. Add baking soda water to a cool compress or small towel and apply to the burn skin. Deodorant: To avoid toxic chemicals found in common deodorants and antiperspirants, use baking soda mixed with water instead. Toothpaste: Use baking soda by itself or use a mixture of six parts of baking soda to one part of sea salt. Rub either onto your teeth and gums. Spit out the excess. This mixture is effective at killing mouth bacteria and whitening the teeth. It can also be used in the nostrils to kill pathogens. Insect bites: Apply a paste made of baking soda and water to help relieve itching. You can also rub the dry powder onto your skin for bites and itchy rashes - even poison ivy. Exfoliator: A paste made from three parts of baking soda combined with 1 part water works as an exfoliator for your skin. It’s inexpensive and gentle enough to use every day. Detox bath: Baking soda and apple cider make a wonderful spa-like bath for soaking away aches and pains and helping detox the body. It also cleans the tub and the drain. Sprinkle baking soda on the surfaces in the kitchen and bathrooms and scrub. You can add a few drops of essential oil for even better cleaning power. Lavender, tea tree and other herb oils have potent anti-bacterial qualities. Baking soda mixed with apple cider vinegar has many uses. As a drain cleaner, sprinkle baking soda down the drain, then add apple cider vinegar and let it bubble for 15 minutes, then rinse with hot water. This is a safer alternative to dangerous drain cleaners. To get rid of baked-on food, soak pots and pans in hot water and baking soda for 15 minutes, then easily wipe clean. Use baking soda to scrub the barbecue grill clean. Clean baby toys and other items around the house with a mixture of 4 tablespoons of baking soda and 1 quart of water. It can be used as a fabric softener in your laundry or to get your clothes whiter and brighter, add one cup to the laundry load. Baking soda is a natural carpet cleaner. Sprinkle it dry onto carpets, let sit for at least 15 minutes and then vacuum up. To polish silver without using toxic silver polish, put hot water in the kitchen sink, a sheet of aluminum foil and baking soda. Let the silver pieces soak until clean. De-stink your shoes by sprinkling baking soda in them for a natural deodorizer. It will probably also eliminate toenail fungus. Minor grease fires in your kitchen, can be snuffed out by dusting with baking soda.